How to buy icons under the Extended license? The default license on Iconfinder is the Basic license. However, we also offer the possibility to buy icons under the Extended license for projects that go beyond the scope of the Basic license. The Extended license is more permissive and allows using icons on merchandise for sale or as part of book covers, for example. Please make sure to read the terms of this license beforehand. 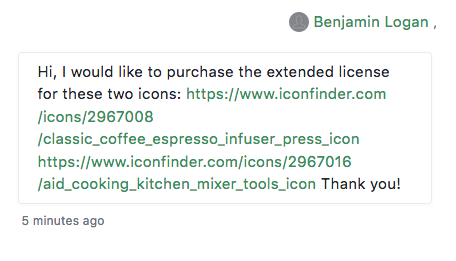 You can now buy icons with the Extended license directly from designers, using the Messaging tool on Iconfinder. It is as easy as writing the designer a message and making the payment through Iconfinder. The price for the Extended license is $10 per icon. Click the Message button in order to write a message to a designer. Ask the designer if you can buy some of his/her icons under the Extended license. The Payment request will look like the one below. You can either pay or cancel the request. You can make the payment directly through Iconfinder. You will also be able to download the receipt of the payment. Once you have sent the payment, the designer will send you the icons through the Messaging tool. You need to confirm the delivery of the icons if everything is alright. In case there is any problem, you can use the Report problem button from the Messaging tool. And you are good to go! Always refer to the terms of the Extended license when using the icons.